First public interests on fossil tracks arouse between 1800 to 1830, with the discovery of large tridactyl footprints in Jurassic sediments of Connecticut, and interpreted as marks left by "Noah's Raven" or other giant birds; Noah's flood was still a popular explanation. The first scientific work on tetrapod ichnology, about Permian tracks of Scotland, was published only in 1831 by Rev. Henry Duncan. In the following years descriptions of hand - like spurs, denominated Chirotherium, and other ichnofossils found in sandstones of the European Permian and Triassic followed. There are however rare examples of naturalists much earlier than the 19th century, who studied fossil tracks and in part interpreted it correctly. The "Rinascimento" (Renaissance) was a cultural movement, born in Italy it influenced profoundly the 14th to the 17th century, dedicated to empirical knowledge and developing theories based on observations. The widespread outcropping, easily accessible Mesozoic and Cainozoic sediments of the Italian peninsula played an important role for the advancement of geology and the interpretation of fossils and ichnofossils. The cretaceous "Marne a Fucoidi (Fucoid - marls)" are known for their abundance of the Fucoides, dark, branched sign in marls, described in 1823 by the French geologist Adolphe Brongniart based on Italian material and considered the remains of algae - only in 1881 the ichnofossil character of these burrows was recognized and the modern term Chondrites adopted. Fig.1. Examples of Chondrites as can be found in the "Marne a Fucoidi", late Cretaceous marls outcropping in the Bottaccione Gorge near the city of Gubbio, Umbria. In fact these burrows of invertebrates are so abundant in the sediments, that the marks are mentioned in historic travel guides, and the great geologists Lyell and Murchinson visited Italy to study these fossils. 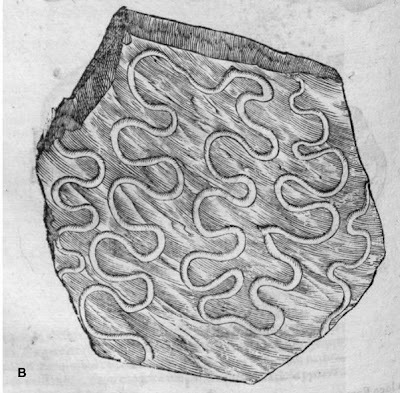 Another kind of common fossil trace, found often in the Italian geological formations of Cainozoic age, is Zoophycos, described by Villa Antonio in 1844, and named formally in 1855 by the naturalist Abraham Massolongo. Fig.2. Zoophycos found in the Trubi Formation of Zanclean age (Pliocene) at Scala dei Turchi, in the Rossello composite section (Sicily). It's no wonder that 300 years earlier these unusual signs on rocks were noted by the first empirical naturalists. Among these, the universal genius of Leonardo da Vinci (1452-1519), who based on recent observations of animals behaviour, speculated about fossil and geology far ahead of the common assumptions of his time. 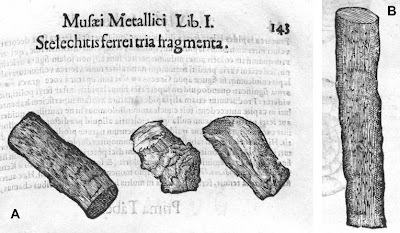 It is known that Leonardo rejected the idea that fossils (his ""nicchi", shells as he describe them) in sediments were of inorganic nature or even the evidence of a large, single flood, he recognized that the deposition of these" features" in the sediments needed much more time and occurred incessantly: a first glimpse of the process of fossilization. Fig.3. Most references to ichnofossils by Leonardo deal with their description and interpretation - the only known possible representation of a ichnofossil by da Vinci can be found on the folio 25r of the Codex I. (written between 1504-1510). 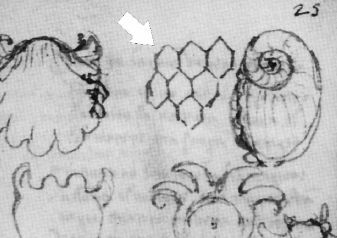 Leonardo depicted several mollusc fossils (maybe to study them for heraldic use), among them a hexagonal structure that resembles the trace fossil Paleodictyon (figure from BAUCON 2010). However Leonardo never published or presented his observations and deductions to the public, and so his knowledge had to wait for 300 years in his secret notebooks to be rediscovered. These were still dangerous times, the naturalist Ulisse Aldrovandi (1522-1605), who lived shortly after Leonardo, spent his last years of life in house arrest, accused of heresy by mother church. Aldrovandi was a son of the Renaissance: he studied law and philosophy and other arts, but got interested in zoology, botany, medicine and geology. In one of his most important naturalistic work, the "Musaeum Metallicum" published posthumous in 1648, he describes, classifies and represents hundreds of "fossilia", a term including all things found in the underground and excavated, like rocks, soils, fossil resins, minerals and trace fossils - and some monsters and oddities. So he compares some body fossils to anatomical parts of modern animals, implying a connection, but for other fossils, displaying no superficial resemblance to living animals, he still relies to a inorganic forming force modelling the rocks. 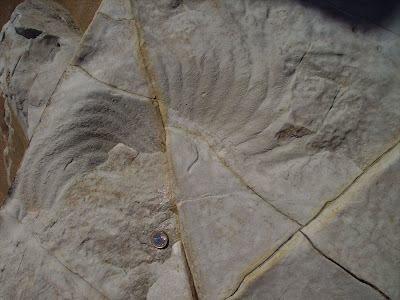 Nevertheless the tentative comparation is a great achievement, it must be also considered that the true nature of fossils, intended as remains and tracks of ancient animals, will be accepted universally only in the late 18th century. This ambivalent approach can be also observed in the ichnofossils: Aldrovandi refers to a rock with holes and hollows as "Silicem dactylitem", because the apparent resemblance to the borings of modern bivalves, like Pholas dactylus, a species of lithophagous bivalves found boring in the rock on the shores of the Mediterranean Sea. This comparation seems intentional and Aldrovandi in fact in a later chapter describes in great detail observed modern bioerosion caused by mollusks. Fig.4. 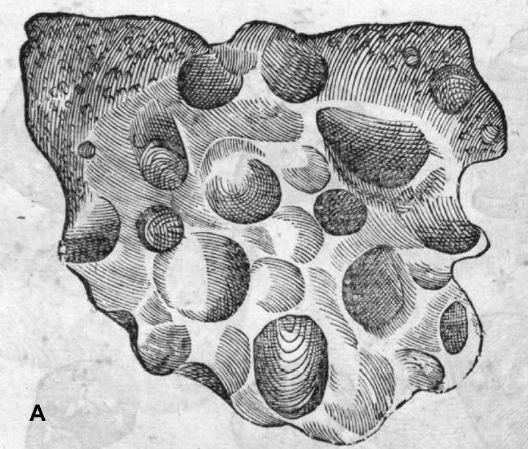 "De Silice", pictured in Aldrovandi's (1648) Musaeum Metallicum and interpreted as borings of mollusks (=Gastrochaenolites) (figure from BAUCON 2009). Fig.5. View of the plate with Cosmorhaphe. This illustration is remarkably realistic, thanks to its extreme detail (for example the semicircular furros in the track) and to the use of hatching to restore three-dimensionality and volume to the subject (figure from BAUCON 2009). Fig.6. 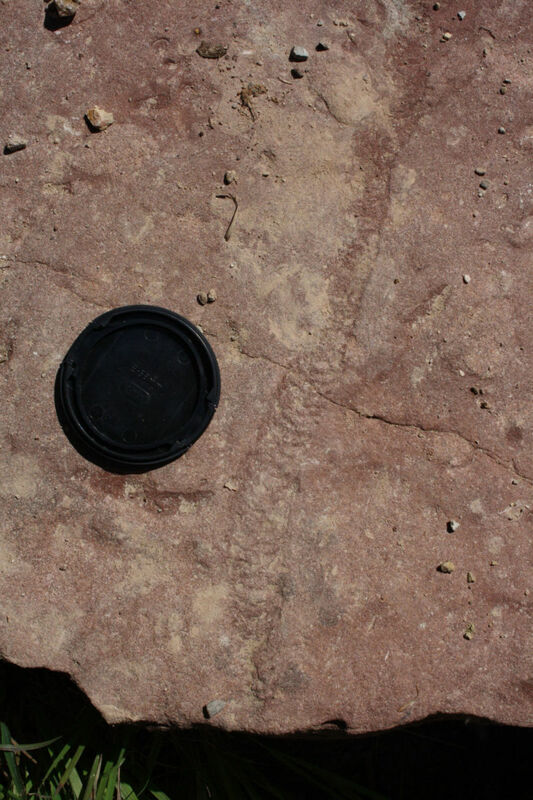 Example of invertebrate tracks in the Triassic Gröden-Formation, South Tyrol, resembling the kind of ichnofossil depicted by Aldrovandi. Fig.7. "Stelechites" Aldrovandi uses this term to indicate subcylindrical, arborescent elements. Some specimens of "Stelechites" represent trace fossils, but most are only concretions. A. 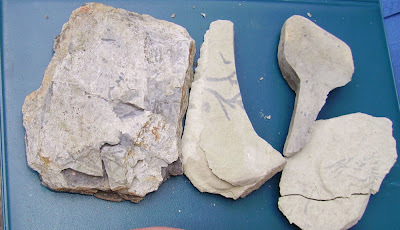 "Three varieties of Stelechites" resembling fragments of a burrow. The specimens shown are currently preserved at Palazzo Poggi (Bologna). B. Another specimen of Stelechites, possibly a trace fossil (figure from BAUCON 2009). Fig.8. 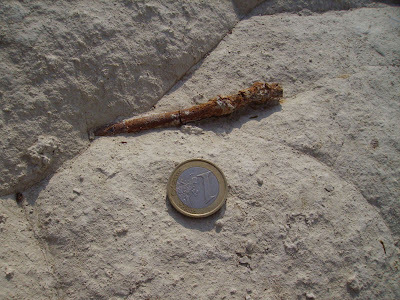 Fragments of a burrow infill emerging from marls of the Trubi Formation and in the overlying Monte Narbone Formation at Punta Piccola (Sicily) - the ichnofossil fits the description given by Aldrovandi as tree-like structures, maybe the notion of the "hardness of iron" is related with the apparent resistance against erosion by the ichnofossil in comparison to the surrounding rocks. Despite the work of Aldrovandi was published, many of the accomplishment of both Aldrovandi and Leonardo were for a long period neglected and forgotten. Only 300 years later the knowledge of these two personalities' was rediscovered, and only now we begin to appreciate what both naturalists-artists achieved.